Nicole's Needlework: With My Needle Finished! I finally finished "With My Needle" today!! I'm so glad to have it done! The Goode Huswife "With My Needle"
I haven't tea-dyed it yet (obviously). I'm still trying to get up the nerve to do it! I don't want to mess it up! Maybe I'll try it in a couple days. Well, now I think I'll get back to Paradise Lost. I really want to start CaHRH, but I think I'll wait a little bit. I would love to finish up a couple more things before starting another big project. Wonderful finish Nicole. I hope the tea dyeing goes well. Have fun at Pals Retreat. Beautiful! Can't wait to see it after it's tea bath! This piece is beautiful! Can't wait to see it bathed and all framed! It is gorgeous, Nicole!!! Can't wait to see it after you get up the nerve to tea stain it! I just love the colors in this project. Nicole, she is just beautiful. I'm nervous for you - but I am sure it will look beautiful. Congratulations, Nicole! It is such a beautiful piece! What a great finish Nicole! 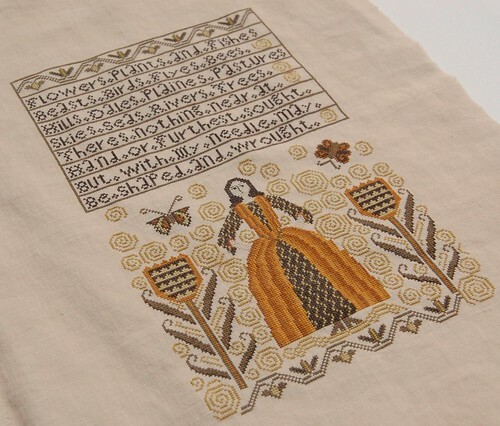 That is such a great piece, and your stitching, as always is fantastic. Can't wait to see more of your Paradise Lost too - that is such a great piece also. This turned out beautifully! I'm so glad that she re-released it as a single chart. Now if she would only do the Ellen Birdseye one! I love that one too. Congratulations on your beautiful finish!! :) And good luck with your tea dying. I am sure it will look wonderful! Have a great rest of the weekend! OMG, it's absolutely beautiful!! I'm hoping to start on that soon. I love the colors. Well done, Nicole! I love this one and you've done a superb job of it. Wonderful that they've released this chart on its own. I'm sure you'll have no problems tea dying it, though I'd be nervous as well. Good luck! Very nice Nicole! This one definitely needs to be in my pile..Love the golden swirls! A lovely finish. I would be nervous tea dying as well but I'm sure it will be alright. Congratulations!. Very, very beautiful ! Gorgeous finish, Nicole. I absolutely love this sampler and yours is fabulous! Congratulations on your finish...wow...I love that. That is beautiful. What are you going to stitch on next? I'm not sure you can screw up tea dying. If you do it a little at a time, you should be able to control it very well. I know you hated those spirals, but they are my favorite part of this one! Beautiful finish Nicole. I have this started somewhere in the stitching pile. Now I want to stitch it! Hi Nicole, beautiful work, congrats! Beautiful, Nicole, just beautiful. How come I don't like a certain project until I see you stitching it? You'll do fine with the tea bath--you have a great eye for color and you'll only be perfecting it. Wonderful finish. Such a sweet chart. It's beautiful, Nicole. I've tea-dye, coffee-dyed, and distressed in various ways. They all work. It just depends on what kind of effect you're trying to achieve. For aging, I like to rub damp, used coffee grounds in random spots of the linen (before or after stitching). Let it dry and brush grounds away. I actaully keep a zip-loc bag of used coffee grounds in the freezer for just this reason. She's just lovely Nicole, you did a great job! This was one of my all time favorite stitches! You're so speedy, I don't see how you do it with everything else you do being a Mommy! I aspire to stitch more because of you! This is gorgeous Nicole! Are you going to frame it? Beautiful! I love how it came out! 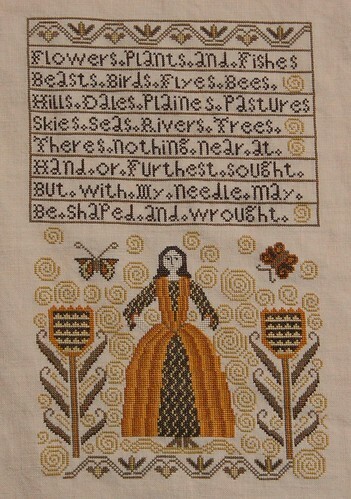 I just saw this this weekend in person -- one of my friends at the stitching weekend is working on it too. She's using a darker fabric for it and it also looks stunning. I hope the tea dyeing goes well! Very pretty! Congrats on the finish. Wonderful! I am just getting started on this one and I can't wait to get it finished up! I can't wait to see your next new start. Congrats on the finish. This is so pretty! I have this chart coming to me too since I saw it on your blog. I think we must have similar tastes as I always seem to want what you just did LOL.